Alex Winter reveals that Bill & Ted 3 is still happening and has found financial backers. Alex Winter also added that the long-awaited sequel is currently in the pre-production process. Over the summer, Keanu Reeves was confident in the film, but was unsure if it was really going to happen since they hadn't been able to track down any financial backing. Thankfully, Winter recently cleared the air and gave an update on the project that is lightyears from what Reeves was talking about just a few months ago. Alex Winter is currently out promoting his Panama Papers documentary and he can't be interviewed these days without getting asked about Bill & Ted 3, aka Bill and Ted Face the Music. The sequel has been in the works for the last ten years, but it's closer to actually happening now than ever, according to Winter. The actor had this to say about the current state of the film. "Well, we're in pre-prep and are set to shoot in early 2019. So right now, all systems are go. My old line when Blockbuster was in business was that I'd never believe a film was a go until the video was at Blockbuster. But I don't know what to say anymore... Netflix?" It's nice to finally get another update about Bill & Ted 3 from an official source. Keanu Reeves is currently working on John Wick 3, and is more than likely getting close to finishing. This should leave the early part of next year open to bring Bill and Ted back to the big screen. Alex Winter went on to say that the sequel finally found financial backing, which was a previous hurdle that the project had. He explains. "The idea was hatched by the four of us about 10 years ago - Keanu and myself and Chris Matheson and Ed Solomon. It didn't happen without a lot of work. Most films aren't easy, but a comedy sequel 25 years later wasn't a slam dunk for most studios. While they loved the script it took us time to convince the financiers. And when they came on board they really came on board. And you know, they've had plenty of time to make the script great. The upside of it taking so long is the script is really good!" Fans are all ready for Bill & Ted 3, and they have been for years. However, there is still some pressure attached to making a sequel 25 years after the original movies. The first two installments are comedy classics, so making a sequel was definitely not an easy decision to make. However, it turns out that the fans are a big reason that the movie is happening at all. Alex Winter had this to say when asked about the reaction to the announcement of Bill & Ted 3. "It was an interesting litmus test. But the fan response has been enormous. It helped us get the financing because there was an overwhelmingly positive response to the idea of us doing this. Even in the age of internet comment trolling, we haven't really encountered any pervasive negativity. The concerns that I've encountered are totally valid - don't screw up the tone of the first two, make it a real Bill & Ted movie. And the question of how you revisit these characters so much later, that I'm not concerned about, because we think the comedy works great. Not that I want the film to stall any longer, but in a way, given the plotline, the older we get the funnier it gets." 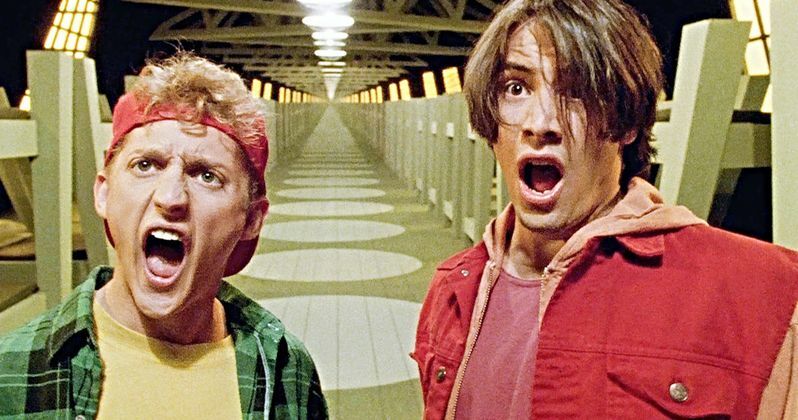 Keanu Reeves and Alex Winter have been into making Bill & Ted 3 for years, but only if the script was done in the right way. It appears that everything has finally lined up for the project to get off of the grand. Let's hope that the next story about the project is an announcement that the cameras have started rolling along with some set photos. The interview with Alex Winter was originally conducted by The Hollywood Reporter.